We’re rediscovering some real gems in our collection! Just about 7 years ago, Mr. Rick Campbell was kind enough to share his memories of the Chapman – Beverley Mill and the Broad Run, VA area with Turn the Mill Around Campaign representatives. In this short clip from the interview, Mr. Campbell remembers the impact of hurricane Agnes and how Beverley Mill Drive in Broad Run, VA got its name. Earlier this year, lead archaeologist, Dr. Mike Johnson, wrote up a progress report of the archaeological work that has been done at the Mill to date. We’re excited to present Part 2 of his “Thoroughfare Gap Archaeology News” below (Click HERE for Part 1). Expect to see Part 3 of the September TGA news posted here in the near future. Based on that assessment, at the beginning of this year three, four-foot squares were laid out in that area. Square 1 was placed adjacent to and outside the western wall of the historic foundation. That was to identify a possible builder’s trench for a possible house and to avoid historic disturbance to the prehistoric stratigraphy, which might be higher inside the foundation. Square 2 was placed just inside the foundation immediately east of Square 1 and Square 3 was placed in the center of the foundation immediately east of Square 2. Excavations on the three squares have been going on throughout the Spring and Summer of 2016. As of this writing they are approximately 15 inches deep and several inches below the last historic evidence. The historic part of the site was extremely interesting and produced a wealth of data. The artifacts indicated that the feature was occupied throughout much of the 19th century. Burned soil, charcoal and burned artifacts indicate that the site may have burned down, although not due to a fire of the intensity needed to melt glass. Rock rubble within the foundation indicated that the house walls were stone part of the way up from the ground. Artifacts also indicated that a female occupant possessed fine quality clothing as indicated by the quality of the female buttons. The ceramics and glass also indicated some degree of affluence (Figure 5). Figure 5. Sample of historic artifacts from the 2016 test excavations. Figure 5 shows: (1) a floral decorated brass button; (2) a floral decorated black glass button; (3) one side of a carved bone utensil handle; (4) an agateware doorknob sherd; (5) a cluster of in situ “ironstone” basal sherds; (6) a cut glass (jet ?) cross pendant; (7) a floral embossed tableware bowl sherd; (8) a brass, two piece, Civil War, eagle shield button (the only Civil War era artifact recovered from the excavation); (9) the bottom portion of an elaborately molded black glass bottle, and (10) several mended, hand painted floral and annular pearlware sherds. Figure 6 shows the raised feature that is within the rectangular lines of large rocks that are the foundation walls. One can see the drop-off to the screening area on the far side of the raised landform. One of the large rocks that form the foundation edge can be seen exposed next to the water level to the left. The closest test square (Square 1 – N960E3468) is just outside the west wall of the foundation. Two foundation stones can be seen to the south (right) – one under the kneeling pad and the other behind the white spray bottle. Unlike the other two squares, it produced very little construction rubble, indicating that whatever foundation stone that was above ground collapsed inward. One can also see a slightly higher mound between the farthest square and the screen area. It is likely chimney rubble. The foundation has not been mapped but it paces off at approximately 20 feet east-west and 18 feet north south. Figure 6. Looking east toward the 2016 excavation area showing the raised landform of the foundation. It is possible that the site is one of the two shown in the foreground of Figure 7 as it is located immediately before the bend to the north in the current railroad bed. It appears that the collapsed chimney rubble on the archeological foundation is at the east end, like those in the photograph and the position and distance in relation to the mill and old railroad tracks are similar. The alternative is that the archeological foundation is located from where the picture is being taken. At some point it might be possible to approximate the distance from the mill to the nearest house by measuring known distances in the photo and relate them to dimensions of other features in the photo. Figure 7. Late 19th century (?) photograph of the mill and Thoroughfare Gap from the east. Part 3 of this article coming soon! Where Did All the Flour Go? By the early 19th century, the Mill was a major producer of ground corn and wheat in Northern Virginia. Interestingly, it’s likely that some of the meal being produced at Chapman’s Mill found its way to the Caribbean and Europe. Read more in this excerpt from Beverley (Chapman’s) Mill, Thoroughfare Gap, Virginia by Frances Lillian Jones. Portugal was a large importer of Northern Virginia corn, wheat, and flour from 1801 to 1815. Spain also imported much wheat and corn during this period. England received substantial amounts of wheat from Alexandria, prior to the enactment of the Corn Laws. The West Indies, however, received the major portion of flour exported from Alexandria. Domestic trade with northern states along the east coast of the United States may have equaled or exceeded Alexandria’s foreign trade during Ante-bellum days. Grain and flour from Alexandria was traded at Washington, Richmond and Norfolk, and small amounts went to Charleston, Savannah and New Orleans. The demand for grain and flour abroad reached an all-time high between 1800 and 1840. It is presumed that a portion of the flour that was shipped abroad, primarily to the West Indies, Spain and Portugal, was ground at the Chapman Mill. According to tradition, George Washington surveyed the land at Thoroughfare Gap in 1748-49, at the request of the Northern Neck Proprietor, Thomas Lord Fairfax. Washington supposedly measured the heights of the Bull Run Mountains on the north and south of Thoroughfare Gap and named them, Pond Mountain, on the south side of the gap, he supposedly named after the large fishing pond formed by the damming of Broad Run. Prior to that naming, Pond Mountain was called South Mountain, and before that it was known as “Broken Hills.” Washington named the mountain on the north side of the gap Leathercoat Mountain, after “Mother Leathercoat,” a woman who, according to legend, operated an inn at the foot of this mountain and always wore a leather apron or overcoat. One of the defining characteristics of the Mill is that is is located on the boarder between Fauquier and Prince William Counties. But did you know that the Mill is actually mentioned in the 1759 Act that created Fauquier County? Here’s and excerpt. The following is an excerpt from a circa 1926 piece written by Mary Susannah Walker McDarment. It was transcribed by her daughter, Sarah M. Turner in 1993. In this the third and final part of her article, Mrs. McDarment relates the story of a soldier who visited the Thoroughfare Gap battlefield years after the Civil War. Some years after the war an old soldier came from California to visit the old battle ground. He said the hardest fighting he was in was in the Battle at Thoroughfare Gap, that his company in Ricket’s Division lost more men than in any other engagement; that with one volley from Longstreet’s men thirty of his men fell, killed and wounded. His own brother was killed at his side. The breast-works thrown up by Longstreet’s men are still standing. I found that the Surgeon of that Regiment was a Doctor Gregory of Alexandria Virginia. I wrote to him and he replied that he knew Lieutenant Freeman well, that he had come out of the war alive and was at his home at West Point , Georgia. I wrote Lieutenant Freeman and received an interesting letter from him telling about the battle in Thoroughfare Gap. He was delighted to get his cup that had lain buried for so many years on the old battle field. He said he went into the fight with the cup fastened to his belt, and as there was a dent in the bottom he supposed a bullet had knocked it off. The cup may have intercepted the bullet and in that way saved his life. Near the mill in The Gap there is a hole where stone had been quarried to build the mill. In this hole the Federals placed sharp-shooters who were picking off the Confederates above. When Longstreet made a rush through The Gap the men in this hole were killed and twenty-five dead soldiers were later taken out. Modern View of Avenel, The Plains, VA. The following is an excerpt from a circa 1926 piece written by Mary Susannah Walker McDarment. It was transcribed by her daughter, Sarah M. Turner in 1993. In this the second part of her article, Mrs. McDarment relates William Beverley’s reminiscences of the Battle of Thoroughfare Gap. “When I was a small boy I went with my mother, who was a near relation of the Lees, to visit at Arlington, the old Lee home. I knew the General when I was a student at The Virginia Military Institute. I was at Lexington when he died and saw him laid in his last resting place. I can remember incidents connected with the Second Battle of Manassas, fought in August, 1862. Just after McClellan’s defeat on the peninsular, he was ordered to withdraw from the peninsular and go to the aid of General Pope who was in command of the Federal forces before Washington. Lee, hearing McClellan was ordered to reinforce Pope, gave orders to Stonewall Jackson to make a forced march and strike out Pope’s army before McClellan could reach him. Jackson, leaving Culpeper, made a rapid march to Marshall – then called Salem – from there via The Plains through Thoroughfare Gap, and was at Manassas capturing General Pope’s provision train before Pope knew that Jackson was within a hundred miles of him. When General Pope, who had headquarters near Warrenton, Virginia, was informed that Jackson was at Manassas, he at first discredited the information but a second courier informed him that Jackson was at Manassas and had captured his (Pope’s) provision train. Pope gave orders at once to General Ricket, who commanded a Pennsylvania Division to occupy Thoroughfare Gap and cut off Lee, who was following Jackson from Culpeper on the same route, through Marshall and The Plains. On the night before the Second Battle of Manassas General Lee with his army had reached the Western entrance to Thoroughfare Gap, his army going into camp along Broad Run Creek and near the present Broad Run station. Being anxious about Jackson, General Lee walked the floor until midnight when a courier arrived with a dispatch from Jackson assuring the General that Jackson was in no immediate danger and could hold out until Lee’s army could reach him. This courier was Lieutenant Tom Turner who was reared at Kinlock, the old Turner home near Avenel and who was a nephew of Admiral Turner of the United States Navy. Lieutenant Turner knew every inch of the ground and reached Avenel from Manassas by making detour from Jackson through Hopewell Gap to Avenel to General Lee, and was later awarded a beautiful sword. Early the next morning General Lee mounted his grey horse, “Traveller” and with his staff rode toward Thoroughfare Gap, and gave orders to General Longstreet to drive back the Federal forces and to take the Gap. General Longstreet sent a regiment over the mountain North of the Gap, one South of it, and a body of troops along the road leading through it. Ricket’s Divsion had a battery on a ridge a quarter of a mile from the East side of the Gap and shelled both sides of the Gap continuously in front of his advance. General Ricket’s Pennsylvanians were hard fighters and brave men. After hard fighting General Ricket was forced to retreat and was driven back in the direction of Washington. General Lee then pushed rapidly forward, joining Jackson and inflicting a disastrous defeat on Pope’s army. 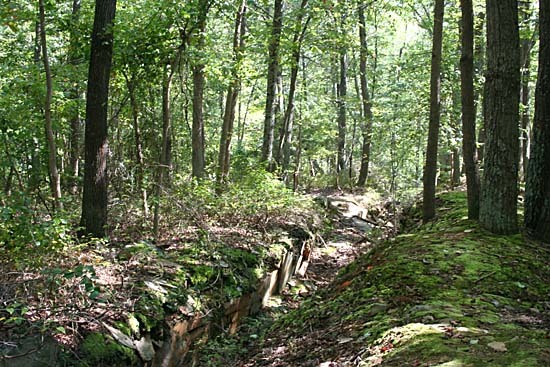 Next week: A soldier visits the Thoroughfare Gap Battlefield after the war. Our mission: To preserve the Chapman / Beverley Mill, provide public access, develop interpretive programs concerning the significance of the Mill and Thoroughfare Gap and raise funds to carry out these goals.